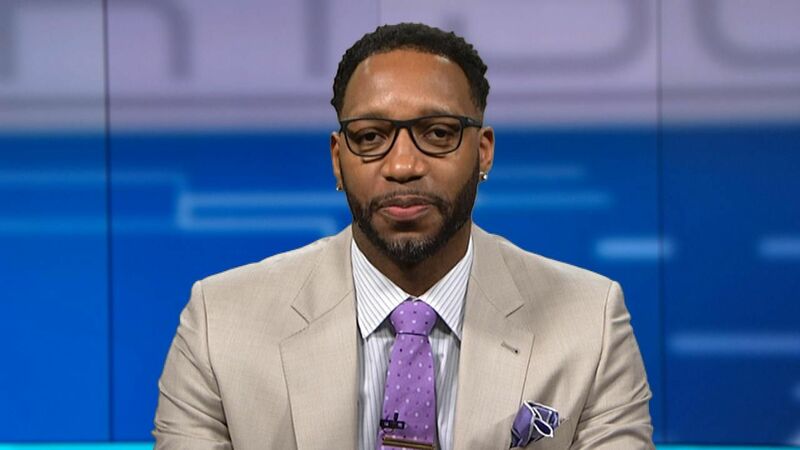 Retired basketball legend, Tracy McGrady will be making good use of his basketball knowledge by joining ESPN as an NBA analyst. He will be regularly appearing on Rachel Nichols’ new show, The Jump, that aired last week. McGrady, who only retired from the NBA in August 2013, hasn’t been away from the game long. He’ll be able to give insight of a former player with an interesting perspective on top-tier NBA draft prospects, who are now required to be one year removed from high school before making the leap to the league. McGrady’s perception on lottery picks and elite talent alone would make him a tremendous asset. Not only could the former basketball prodigy personally relate to possessing extraordinary skills, but McGrady could also elaborate on the psychology that allows a young player to fulfill his potential. Tracy Lamar McGrady, Jr. was born in Bartow, Florida. He played high school basketball and baseball at Auburndale High School for three years before transferring to Mount Zion Christian Academy, in Durham, North Carolina. After an amazing performance in the Adidas ABCD Camp, he was named High School Player of the Year by USA Today. He entered the league straight out of high school. McGrady was a seven-time All-Star whose career could have been even more accomplished if not for nagging injuries. During his career he played for the Toronto Raptors, Atlanta Hawks, Orlando Magic, Houston Rockets, New York Knicks, Detroit Pistons, Qingdao Eagles and San Antonio Spurs. Peaking with the Orlando Magic, McGrady averaged 32.1 points, 6.5 rebounds, 5.5 assists and 1.7 steals per game in the 2002-03 season. McGrady was ranked on SLAM Magazine’s “Top 75 Players of All-Time” in 2003. McGrady has traveled to the Darfurian refugee camps in Chad with John Prendergast and Omer Ismail of the ENOUGH Project. McGrady is actively recruiting NBA players to support a sister schools initiative linking schools in Darfurian refugee camps to American middle schools, high schools and universities. In 2009, McGrady changed his jersey number to #3. He made the switch to promote his humanitarian efforts in the Darfur region of the Sudan and a documentary on his summer 2007 visits to refugee camps in the region. The documentary is called 3 Points. However, he went back to wearing # 1 when he joined the Pistons. There’s no doubt that McGrady will be making a big impression on ESPN. His recent partnership with the station and set appearances on Rachel Nichols’, The Jump, should make for some great basketball analysis. If your company is interested in finding out availability and booking fees for a former professional basketball player like Tracy McGrady or other sports celebrities for a Keynote Speech, Fundraiser Event, Guest Appearance, or Football Camp, call us at 1-888-246-7141.